Hill climber, salt racer, survivor, the '28- '29 Super X. Like almost all racers of the era the bike is a bit of a mongrel, changed as its owner searched for more speed. The frame is mostly Indian parts put together years ago by Al Skrelunas and the tank is from an Indian Warrior. Olson thinks the forks are from a DKW RT 125. 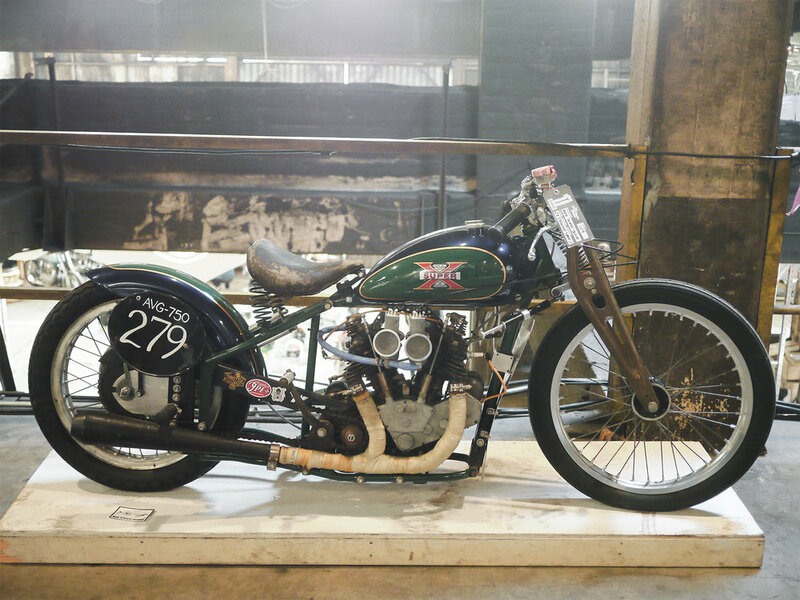 The design of the Deek was given to Harley Davidson as war reparations in the '40s. 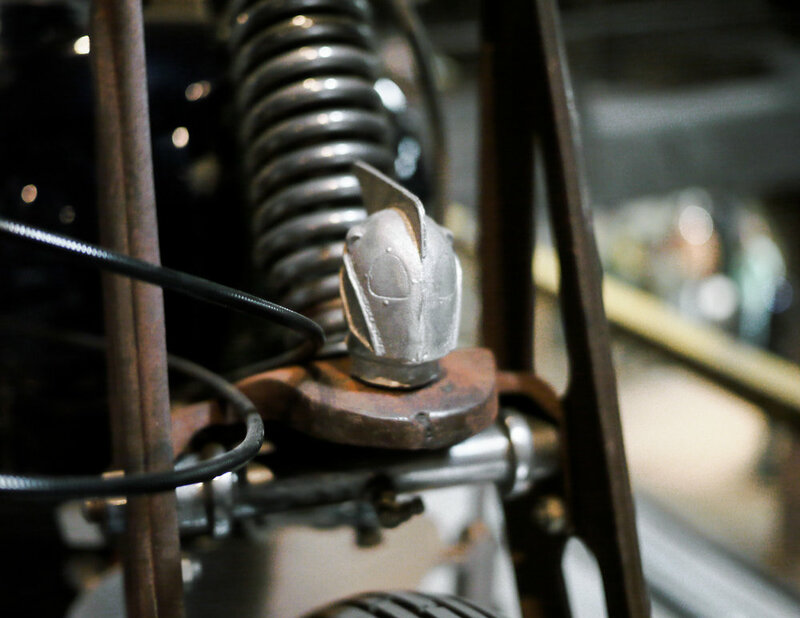 The fork looks like early Harley 125S with a spring instead of the rubber bands. Olson has the original Super X wheels but built up this set to run at Bonneville. Spotlight | I met Morto Olson and his wife Gina at One Moto through a comedy of errors. I had spotted his green 1929 Excelsior Super X as soon as I walked up the stairs to the top floor of exhibits. Earlier in the day we met some folks who had come for the show and we had a nice talk as we waited to check in at the hotel. Now I will freely admit that as a person gets older the eyesight gets a little wonky and I think that played into the mixup. When I met the Olsons at the show I thought, at first, that he was the fellow that I talked with at the hotel. He was not (although the resemblance was uncanny). When I said hi he looked at me for a second like, what? But being the jovial fellow he is, he was happy to talk about his past, motorcycles in general and his Excelsior specifically. 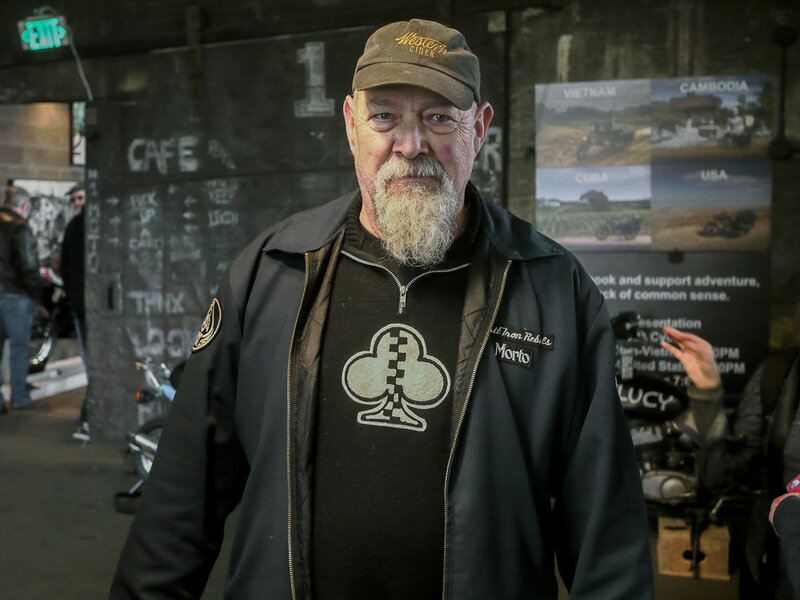 Olson has an infectious enthusiasm for motorcycles and he tells a great story. Olson got the Excelsior racer in 2001 from Al Skrelunas who had been a national plate holder and hillclimb racer in the '40s and '50s. He shows up in race results as late as the '70s hillclimbing a Harley. When Al decided to sell the bike, Morto and Gina drove out from Montana to Portland on their first road trip together to buy the bike. Dig those Amals. Morto says there is not much left that is Excelsior except the engine on the old hill climber. Before the Great Depression Excelsior (not to be confused with the English firm of Excelsior) was one of the big three American makers of motorcycles. Indian was in the top spot with Harley-Davidson and Excelsior following close behind. Excelsior was owned by the Schwinn bicycle company. As the depression deepened, Ignatz Schwinn determined that the long term prospects were not good and he shut down Excelsior in 1930 when they were at the height of their powers.